Hi there sewing friends! I wanted to pop in and show you how to dress up one of my favorite sewing notions. Pattern weights!! These are simple 3/4'' washers that I picked up from Home Depot to use as pattern weights. I thought it would be fun to make them pretty to give a little gift to my mom on her birthday. 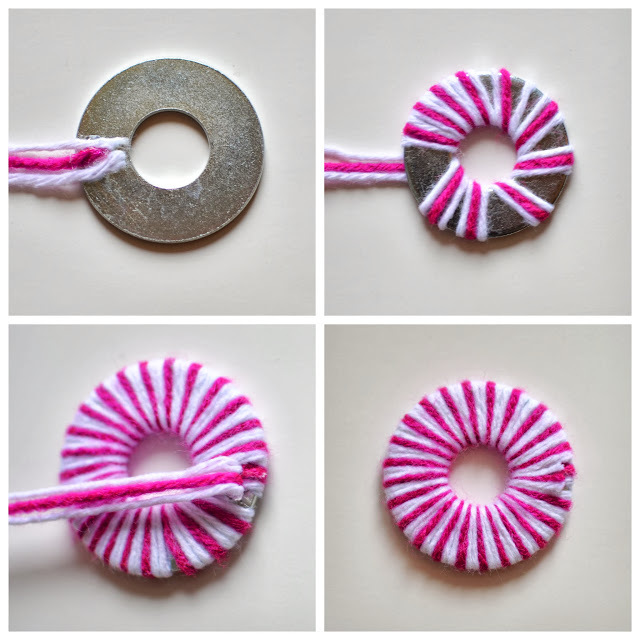 I've shared how to make Mini Yarn Wreath Pattern Weights in the past as part of National Sewing Month with The Sewing Loft but I thought it would be fun to share here again too. I think they are the perfect gift for a fellow sewist, don't you? 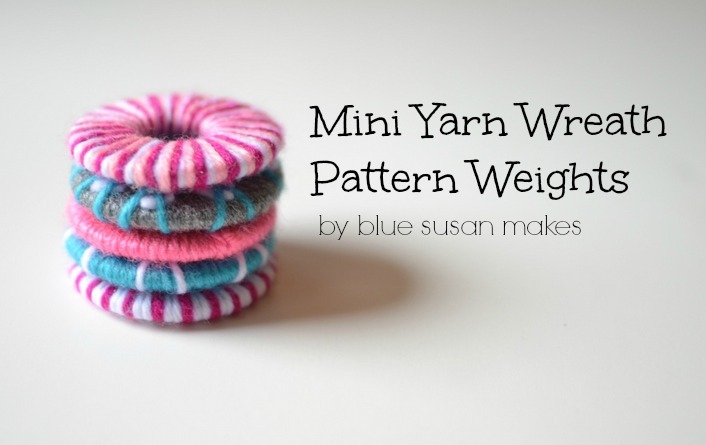 Do you use pattern weights? My whole life I've used good old table knives as pattern weights but these are much cuter. And I don't have to wash them and put them back in the utensil drawer when I'm done. These little cuties are so easy to make! It's fun to play around with different colors of yarn and bits of felt. I think the purple one is my favorite! Want to make some? I'll show you how. It's easy!! Start with 3/4'' washers from the Home Depot. I think they cost me a little over 50 cents each. They are about 2 1/2'' wide. Cut 3 lengths of yarn about 45'' long. Wrapping 3 at a time makes the wrapping go faster. Stick the ends on the back of the washer with a dab of hot glue. Wrap the yarn evenly and squish it together as you go. Finish it off with another dab of hot glue right where you started and trim away the extra yarn. On some of them I added bits of felt for even more cuteness. I just glued on the felt bits and then wrapped an additional length of yarn around them. Love the argyle look! Once and a while I find that I need a little more weight so I just stack up two pattern weights as needed. I packaged them up for my Mom in a little paper mache box from my local craft store! ...and tied it up with a little ribbon! A great little gift to add to your list :) Now I need to dress up my own. If you make a set of pattern weights like these, I'd love to see them! I used these this week to cut out my friend's wedding dress. They are awesome. Work like a dream and they are so fancy compared to butter knives ;) I am so glad that you gave them to mom and that I benefit from using them. You rock! These are so cute..great idea thanks! !